TransTel Lynx - The TransTel Lynx – Small. Flexible and talented, just like your business. User friendly and affordable – the TransTel Lynx comes pre-programmed with simple ‘plug and play’ default data base, but can be easily customized to meet the specific needs of a more complex install. The basic TransTel Lynx comes pre-configured with 3 outside (CO) Lines, 4 Digital Extensions complete with 4 X DK7-21 LCD Hands free phones and 4 Single Line Extension ports. 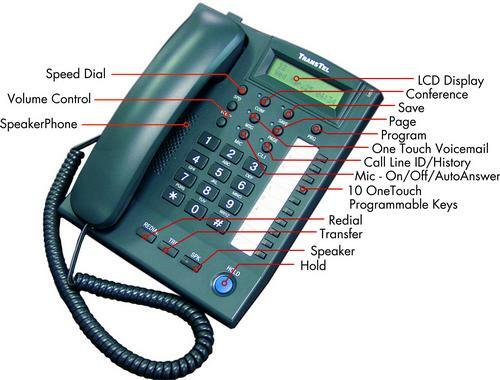 The Trantel Lynx comes standard with a 2 port (4 Hour) Voice Mail and has Faxability capability on all CO lines. The standard TransTel Lynx can also be further expanded by another 2 CO Lines and 4 Single Line Extension ports giving a maximum of a 5/12 configuration. The TransTel Lynx comes packaged with four DK7-21 Digital Phones. The DK7-21 is simple in design but offers a complete set of features and functions that are required in today’s business environment. The DK7-21 Digital Key phone equips with maximum 10 programmable (CO, Extension, Functions and Speed Dial) keys with dual-color LEDs and 14 functional keys. The DK7-21 series Digital Key phone can used at all Gx Series telephone systems and Hybrid IP Communication systems on a DK port interface. As with all other DK series handsets the DK7-21 utilizes single pair wiring making deployment over existing installed cabling simple and painless.